MOSCOW, June 5. /TASS/. Russian President Vladimir Putin conveyed some irony about the uproar around Russia’s Ambassador Sergey Kislyak’s alleged contacts with US President Donald Trump’s team. In an interview with NBC News anchor Megyn Kelly, Putin said how he once met former US security adviser Michael Flynn at an event in Moscow. 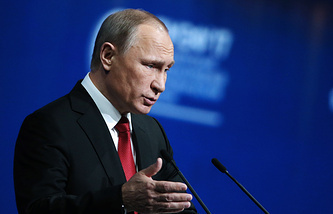 "When I came to the event at our company, Russia Today, and sat down at the table, next to me there was a gentleman, and someone else was sitting down on my other side," Putin said. "I made a speech, then we talked about something else, then I got up and left." "That sums up my entire acquaintance with Mr. Flynn," he added. Putin noted that he had been communicating with the NBC reporter far longer before and after the interview, he said. "You and I, we have a much closer relationship than with Mr. Flynn. You and I met up last evening. You and I have been working all day together and now we meet again," he stated. "If Mr. Flynn and I had this kind of interaction, whereas you and I, we have spent an entire day together. Given that Mr. Flynn was fired from his job, you then should be arrested and put in jail," Putin said jokingly. Donald Trump appointed Retired Lt Gen Michael Flynn to the post of security advisor. On January 20, 2017, he assumed this position. However, on February 13 he was compelled to resign. Media reports said Flynn either misinformed US Vice President Michael Pence on his contacts with Russia’s Ambassador in Washington Sergey Kislyak in December 2016 or failed to present comprehensive information about the talks. Politico magazine reported citing anonymous sources that US President Donald Trump "appears to question decisions even after they’ve been made" with regard to Flynn. Later, Flynn was reported to have been paid $50,000 by Russian companies. Flynn was paid the bulk of the money for his speech for RT television network at a conference in Moscow.